When you work in an area where you may encounter difficult conditions underfoot, you need the best nonslip shoes available to ensure your safety. This type of shoe is a prerequisite when you work in many different industries including kitchens (click here for the right shoes), restaurants as servers, the docks, factories and others. 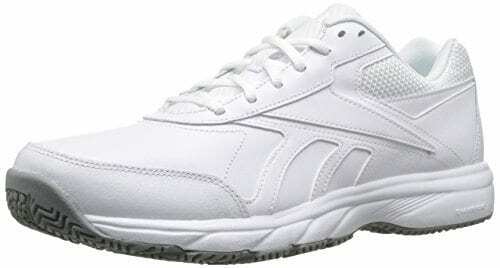 In fact these types of shoes are required by your employer to adhere to safety regulations. We look at some of the greatest on the market, we consider their construction, type of sole, how slip proof they are when walking on wet, oily, greasy or any other slippery surfaces. 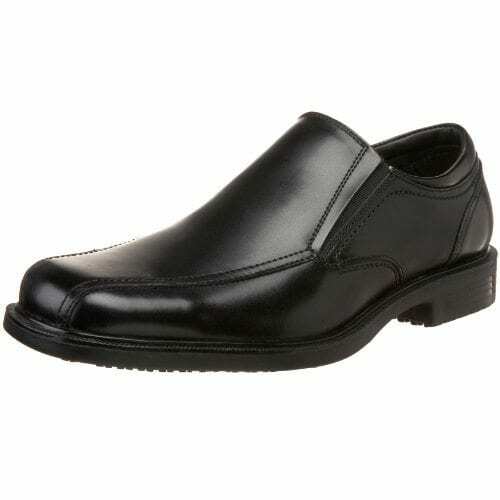 Nonslip shoes are also great for nurses due to the added practicality and safety aspects. For those in need of comfort for issues such as neuropathy – click here. View the Best Non Slip Shoes, Below. How do slip Resistant Shoes Work? What are the Best Shoes for Servers? What kind of Shoes are Considered Non-Slip? What Brand of Shoes is Non-Slip? We consider what materials they are made from, what kind of tread and sole they have and how well they will protect your feet from hazards. No slip footwear items are those that have soft, pliable soles with intricate tread that help you to prevent yourself from slipping when walking on slippery surfaces. There are many different types and styles on the market, some for work and some for leisure. We review the top 12 nonslip shoe products on the market and let you decide which one is best for you. Skechers is one of the most well-known brand names when it comes to nonslip shoes and it should be no surprise that they feature more than once on our list. The Skechers Men’s Rockland Systemic are one of the best in their collection and one of their most popular. Oxford style casual design shoes with lace-up closure and non-slip outsoles offering you the best traction for working in any environment. These shoes meet the Mark II standards for non-slip qualities and also the EH standards for safety. The Rockland features a low profile, rubber outsole that offers excellent grip to ensure that you footing remains sure even on slippery, wet or oily floors. They do not have as much of a distinctive tread pattern as some of Skechers offers, yet still offer the superb traction Skechers is known for. The extra grip comes from the sole that goes all the way up the heel to the perimeter helping you to grab and grip the surface firmly. The Rockland are stylish shoes with a leather upper and stitching with a leather overlay. Comfort and style meet here to make your work day a lot more comfortable and safe no matter you find yourself. Casual stylish work shoes with leather uppers and leather overlays. Low profiles with superb traction an outer rubberized sole that extends up the heel, make it ideal for kitchen staff and restaurant workers to use. They are also great for casual wear to ensure your safety in any environment. Skechers does it again with the Men’s Flex Advantage that are the best for any working or leisure environment. They are not only safe but also very comfortable for those that are on their feet all day long. Sneaker styled shoes that are durable and stylish with a leather upper combined with mesh and synthetic fabrics which offer both flexibility and breathability. The soles are rubberized and will offer you secure grip on any surface. 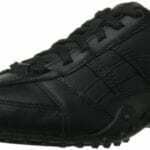 The tread pattern on the sole ensures that you get the grip you need and the lace-up closure keep your shoes on your feet securely at all times. The gel infused memory foam insole means that while you are secure on your feet, you are also comfortable. They are also removable so people with special orthopedic inserts can substitute them if needed. The Flex Advantage is best for servers as they are designed for people who spend the whole day running up and down in their job. Style and function are what you get with the Men's Flex Advantage from Skechers and you will never regret spending those extra dollars on these superb non-slip shoes. Another highly popular Skechers non-slip shoes that can be used for both work and leisure. Service industry workers will love these shoes as they are ultra-comfortable with gel infused memory foam insoles that are replaceable and lace-up closures to keep your feet securely in the shoes. Wet, slippery surfaces are no match for these great shoes. 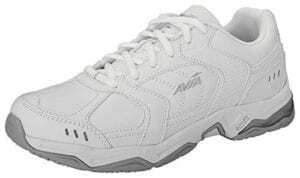 Looking for the best non-slip shoes that are best for any environment and will not cost you a lot of money, you found it in the AVIA Women’s Avi Union Service Shoes which are designed with people working in the service industry in mind. The synthetic leather upper of the shoes are both water and stain resistant, it is durable and comfortable and are the best work shoes for serving staff, nurses and other similar professions. The molded EVA soft gel heel offers great shock absorption and extra comfort in the midsole. The sock-liner is removable so you can replace it with your own orthopedic insole if you like. The tongue and collar on the shoes are padded and it has a mesh lining to allow your foot to breathe. The outsole is not only oil resistant but also nonslip with a rubber tread pattern that offers superb grip on any surface no matter what kind of underfoot conditions. The Cantilever system on these shoes make for a lightweight heel with great stability and comfort. The toe cap on the shoes offer protection in hazardous environments. In the service industry where you are on your feet all day, then the AVIA are the shoes you need. Not only does it have water and stain resistant leather uppers, but nonslip and oil resistant soles with great rubber treading to keep you safe on any surface. OSHA compliant, soft and pliable with a 1.5-inch heel height and a rubber outsole. 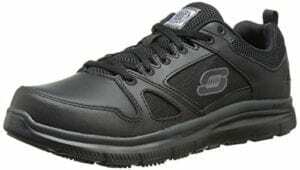 The Women's Soft Stride-Softie is another great offering from Skechers this are great safety nonslip shoes for women who work in the service industry or any other hazardous work environment. A tread pattern that offers superb grip and a removable outsole that is designed to be replaced at the end of its lifespan this is not only comfortable shoes but ones that offer great support and grip. The inside is comfortable with a foot-hugging PU insole which can be removed and replaced with your own orthopedic insoles. 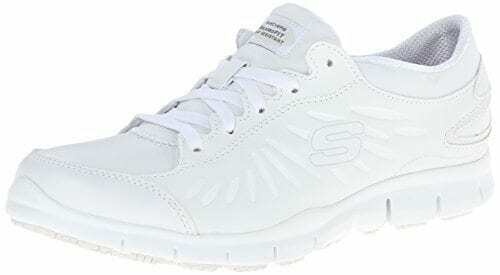 Lightweight, breathable and designed to keep your feet cool and dry while offering maximum protection the Soft Stride-Softie are very popular Skechers for women’s work shoes. Beautifully crafted with a leather upper and detailed stitching with an embroidered logo on the side these are great looking shoes to go with their superb non-slip sole. The perfect pair for any women to wear to while at work or play. A stunning lace-up style workshoe that looks great and offers complete safety in any hazardous footing environment. Lightweight and breathable, you can be on your feet all day and not feel the pain afterward. Replace the insole with your own orthopedic sole and get the support you need. Looks are important when you work in a semi-formal environment but still need something that will keep your feet safe and secure. The Reebok Men’s Work N Cushion 2.0 has a leather upper which not only lends itself to formal wear but is also very durable. The low cut design of the product and beveled heel add to its appearance and is one of the best for the hard-working man to wear. The Reebok is not only non slip it also sports oil-resistant outsoles which is both durable and offers extra support and superb traction when walking on slippery, wet or oily surfaces. The DMX Ride Technology is there for extra comfort and a wider sizing for men with a little wider than normal feet make this a superbly comfortable option. A hard-working, hard-playing man deserves a product that will give him the support, comfort, and protection he needs whether he is in the kitchen working as a chef, serving as a waiter or working as an engineer who is on site and in an office daily. Support and comfort, coupled with great grip and superb nonslip soles are what you can expect from the Reebok Men's Work N Cushion. Works like a workshoe but looks like a dress shoe, one of the best for those professionals who also spend time on site. Excellent working shoes for men who are out and about. Looking for a pair that does not have the appearance of a heavy-duty work boot but offers the same protection as one, then you found it in the Dockers Men's Society Non Slip Slip-Ons. They offer style and elegance coupled with rugged dependability and sure-footedness in any environment. These loafer styled shoes sport a tailored look with a leather upper which water repelling and a square toe and 1" heel, all give it a very elegant look. The elastic goring tongue ensures that the shoe slips on easily and stays on. The double row stitching, textile lining and comfortable insole with gel heel pad are all designed to offer you a workshoe that is so much more than a work boot. Importantly the synthetic sole and rubber outsole ensure superb traction when walking on any wet, slippery surfaces at work or when out on the town with friends and family. They are also great for the older gentleman who wants something to offer support and comfort without having to lace them up. Stylish and elegant, these loafers are best for formal or informal wear as well as for use as work shoes. They are slip resistant shoes that are designed for the discerning man. Water repellent leather uppers and rubber outsole which provides great traction on any surface and the gel heel pad insole allow for ultimate comfort. Skechers, the number one brand name in nonslip shoes does it again with the Men’s Cottonwood Goddard Twin Gore shoes that are designed to get you through your long working day on your feet in comfort and style. Painful feet can be truly debilitating and having a pair of shoes that not only keep you safe when walking in hazardous areas is what you need and what you get with the Goddard Twin Gore. The leather uppers are durable and stylish and the rubber sole and outsole provide you with great traction in any conditions. The relaxed fit of the product ensures that you remain comfortable and the memory foam removable insole allows you to substitute it with your own orthopedic insole if needed. The non-slip shoes have been tested to Mark II standards and also carry the EH compliant stamp of approval. These shoes are great working shoes for people in the restaurant industry especially servers and chefs. Style, grip, and comfort in one great offering that will help you cope with being on your feet all day or night while working. Working restaurant staff from servers to chefs need shoes that will keep them comfortable and safe in any surface conditions. These relaxed fit, leather upper shoes are not only stylish but also safe, tested to Mark II standards and EH safe design the Skechers Men's Cottonwood Goddard Twin Gore will definitely fit the bill. Traditional sneakers with the added benefit of nonslip soles and plenty of different colors to choose from these are great for working ladies who spend all day on their feet in the service industry. The synthetic sole offers a rubber outsole with non slip qualities to give you the best of both worlds. The leather upper is durable and stylish with a heel measuring 1.5" in height and a platform that measures 0.75". Lace-up closures ensure that your shoe stays on at all times and the neoprene collar allows your foot to move comfortably with them. Reinforced overlays on the uppers and elastic sock-liner add to your comfort levels as well as makes it easy to put on and take off. It is lightweight and flexible and if you are a person who stands or walks all day in your job then these are the best option for you. Designed to offer safety and comfort, while still being funky and cute, these are the best shoes for ladies who work in the service industry to use at work. Lightweight, flexible and fun the Dansko Women’s Elise Oxford Sneaker is the best shoe for service industry staff who want to add a touch of color to their lives. Nonslip rubber outsoles ensure safety in hazardous conditions and the leather uppers and reinforced overlays keep your feet safe and secure while you work. Being on your feet all day can be very daunting, and especially if you work in an industry where underfoot conditions can be hazardous. Skechers recognizes the need for ladies to have high quality, secure footwear that are not only comfortable and but also nonslip as well as stylish, hence the Skechers Women’s Eldred shoe. This durable leather upper shoe with a synthetic sole which offers exceptional traction and will keep you from tripping, slipping or falling when working in industries where slippery, wet floors are common occurrences. Lace-up closures ensure that the shoe remains securely on your foot and the rugged, yet soft fabric lining is breathable and comfortable. Memory foam insoles add to your comfort levels to enable you to get through the day without having aching painful feet at the end. 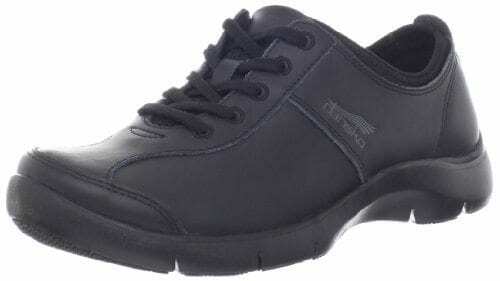 The relaxed and roomy fit allows your foot to flex nicely, this shoe is best for ladies working in the service industry, or in any hazardous environment and will serve you well in terms of safety and security of footing. Being comfortable and secure when working is important, especially when you work long hours on your feet in hazardous environments. These Skechers Women's Eldred are nonslip, stylish shoes with leather uppers and memory foam insoles offer both for those women who are on their feet all day long. Footwear at work is one of the most important parts of your outfit. They should be good quality and keep you safe and secure, especially if you work in industries that cause you to brave hazardous surface areas. 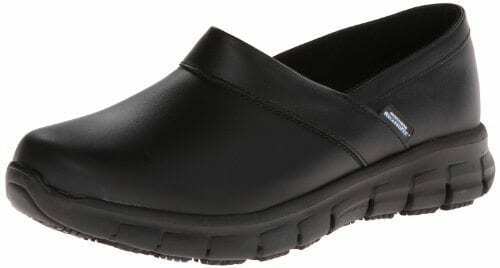 The Skechers for Work Women’s Relaxed shoe is one of the best for the hard working women to wear. These leather upper shoes are stylish and the synthetic sole and flexible nitrile rubber outsole meet the Mark II standards for traction on wet and slippery surfaces. EH safe design makes these shoes the best ones for those working in the restaurant industry either in kitchens or as servers. Hospitality and factory workers will also find these shoes capable of keeping their feet safe and secure during their workday. The memory foam insole, rounded toe box, and padded instep add to the comfort levels of this great shoe. The heel and midsole are shock absorbing and flexible to allow a relaxed fit. A fabric lined interior keep your feet cool and dry during a long shift. Comfort meets style and safety in this great work shoe for women from Skechers. Flexibility, style, and comfort are what you get with the Skechers for Work Women's Relaxed. You also get a nonslip shoe with a synthetic sole and flexible nitrile rubber outsole to keep your feet secure no matter how hazardous the surface area you are working on. A pretty smart casual slipper for women to wear at work. The Sasha Quilt Bow Flats are also a great shoe for the older generation to wear when out and about as it is not only extremely comfortable but also non slip. Lightweight, flexible and slip free outsole and synthetic sole along with the breathable and padded insole make this not only a very comfortable slip free shoe but also a very safe one for both young and old to wear at work or at play. Not only are they best for work but they are pretty and one of the best for a night out with friends as well. The quilted upper with a faux patented leather and mesh lining give it a really great look and the non-marking rubber soles will not leave any marks on polished wooden floors. These really cute, non slip flats are comfy and safe and best for the women who spend a lot of their day on their feet in, and as we said they are one of the best for the senior lady to wear to ensure there are no accidental trips, slips or falls. A pretty and cute casual work shoe that is also one of the best for the senior ladies to wear when out and about. Non-marking rubber outsole and synthetic sole give excellent traction on any surface and the quilted faux patented leather upper gives it a really nice, soft look. 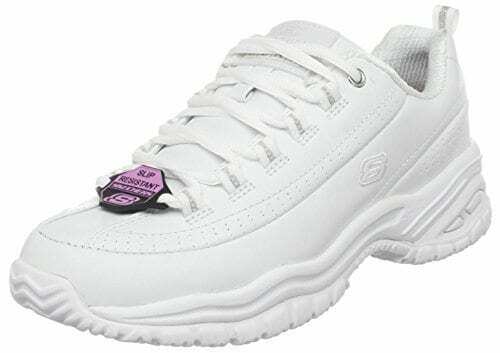 It is fitting that we end off with another one of the best no slip footwear pieces from Skechers the brand name in non slip shoes everybody loves and trusts. The Skechers for Work Men's Flex Advantage is one of the top work shoes for men on the market and one of Skechers finest offerings. A smart casual shoe that features a fabric mesh upper and elastic side gores at the opening to ensure that the shoes stay on your foot no matter what you are doing. The collar is padded for comfort and the memory foam insole will allow your foot to rest snugly in the shoe during the long days at work. A slip-on style shoe, these are best for the older man and people with back problems to wear as you do not have the hassle of lacing up your shoes. They are also one of the best for people who work on boats or like to go sailing. The nitrile rubber sole is completely slip resistant and is tested to Mark II standards for traction and OSHA compliant. Walking on slippery, wet or oily surfaces need not be a cause for concern when wearing the Flex Advantage. Quality, style, and safety meet in this slip-on slip free shoe for working men. The memory foam insole provides superior comfort and the nitrile rubber sole provides the ultimate grip for safety. There is no better slip resistant shoe for restaurant workers, sailors or any other profession that often deals with hazardous. This high quality, best looking, slip-on style make good restaurant shoes that will keep your feet cool and comfortable. Importantly they are also designed as nonslip to keep you sure-footed throughout your day at work, no matter what the conditions underfoot are. Chefs, nurses, servers and other service industry, or factory workers will tell you that the most important part of their work attire is the footwear they wear. Having strong, comfortable and slip-resistant shoes are a non-negotiable in these and other professions, and are often mandatory footwear according to health and safety regulations. In the past slipping resistant work shoes took the form of heavy, ugly boots and they did not fit well with people who worked on site and in the office. Often they would have to change shoes constantly in the day as they moved from one job to another, however, all of that has changed. Now you can get lightweight, smart casual work shoe products that are slip-resistant, with safety toe caps and more. You can now also get casual footwear to use in everyday life that is nonslip. You also get the finest slip-resistant shoes that are cute and pretty for women to wear when out and about. Even if you cannot find slip-resistant footwear in a style that you like, such as high heels for women, then you can always add a slip-resistant sole to your footwear. This is especially practical for women who work in professions such as journalism where they need to have a corporate look, but sometimes have to traverse areas that are hazardous underfoot. You should always make sure when purchasing your slip resistant footwear that they actually do perform as they say. Often manufacturers will state that their shoe is slip-resistant or slip-resistant but in fact, they have rubber soles with no traction at all. This can be very dangerous, especially if you bought them to work in areas where you encounter wet, oily or greasy floors. To check if the shoe is actually slip-proof, you can have a look at the sole of the shoe, the greatest grip provided is due to a pliable rubber sole with unique tread, the smaller the tread, the better the grip. Test the shoe before buying. 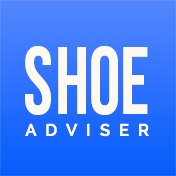 In this buyers guide, we will look at some of the most frequently asked questions when it comes to this specific style and type of shoe. To give you an insight as to what they are made of, how they function and why you should consider buying one. Nonslip shoes are footwear items that are worn to prevent slipping, tripping or falling when walking in hazardous environments. They are rated by a dry static coefficient. This is the ratio of the force of friction between two objects. In the case of slip-resistant shoe products, those two objects would be the sole of your foot and the ground and the force that presses them together. The material used to make these shoes non slip is usually soft rubber on the sole that grabs the surface you are standing or walking on. The tread patterns on these soles are what determines if they are slip-resistant or nonslip soles and if they are suitable to walk on wet, oily surfaces with. Nonslip products enable you to walk with confidence under very tricky conditions. They help you to avoid nasty trips, falls and slips that often occur when using normal footwear and walking on water, oil or greasy surfaces. Slip-resistant shoes are a requirement when working in kitchens, hospitals or working as a server in a restaurant amongst other places. If you often go out, consider applying slip-resistant options to your high heels as encountering water or oil on roads and pavements in today’s world is not uncommon, they are also one of the best assets to estate agents and engineers who spend time both on-site and in the office. Slip-resistant shoes work on the premise that the softer and more flexible the rubber sole you have, with a fine tread pattern, the more grip or traction you will get on the surfaces you are walking on. The soles of these shoes are designed to push liquid away from the bottom of your feet, which prevents you from slipping in water, oil or grease. People working in the service industry, particularly servers or waiters in a restaurant need shoe items that are not only super comfortable but also allow them to walk easily when faced with water, soap or oil on the floors. Accidents are commonplace in restaurants and kitchens. Servers often have to deal with soapy, wet or floors with all sorts of other debris such as spilled juice and the like. They need to be able to traverse these hazardous floors with ease as they serve their customers. Should they not have these slip-resistant shoes, they might trip, slip or fall, be carrying plates, glasses or knives and forks, this could create a very dangerous situation. The most appropriate shoe for servers to use are those that do not only slip resistant but also offer protection for their feet, so a toe cap and solid overlays will go a long way to ensuring their safety at work. Comfort is also very important as they spend a large percentage of their day on their feet, so this could be one of the deciding factors when choosing the most applicable slip resistant footwear for themselves. Any shoe that offers you exceptional traction will be considered slip-resistant. Shoes that have a better traction than your standard footwear usually will have characteristics such as fine tread grooves which provide your sole with better friction between it and the surface, this causes it to grip the surface as you walk and prevent you from slipping or skidding when encountering water, oil or grease on the floor. The tread on these types of soles is designed to move water away from the foot. This helps the sole to gain more traction on the actual surface you are walking on. Soles of nonslip shoe products are usually made out of high-grade rubber, which is not only solid but offers exceptionally strong traction and is proven in its use as a slip-resistant sole. The tread on these soles is the determining factor when considering what constitutes non slipping shoe and what does not, having a rubber sole does not automatically mean nonslip. The grip you can expect will be determined by the size of the tread, very small, fine tread offers fantastic traction, the rubber should also me soft, pliable and flexible. Most of your work boots offer these non-slip qualities. Slip-resistant footwear is a vital part of your working attire when working in areas where hazardous underfoot conditions exist such as in restaurants, kitchens, factories and the like. There are quite a few manufacturers that make skid-resistant shoes. Skechers, in particular, specialize in these types of shoes and are very well known for it. Other brands include Vans, Crocs, Birkenstock and Mozo. Shoes for Crews make a wide range of work footwear along with Merrel, Keens. You should be wary when buying a sports shoe that is nonslip. These shoes are meant to keep you from skidding on wooden floors such as basketball courts but are not meant to be used in areas where there is water, oil or grease on the floor. There are a lot of brands out there that claim to make slip-resistant footwear for both leisure and work environments. However, you should be wary when purchasing these shoes as a lot of manufacturers simply stamp their shoes as no slip and they are not at all no slip in nature. 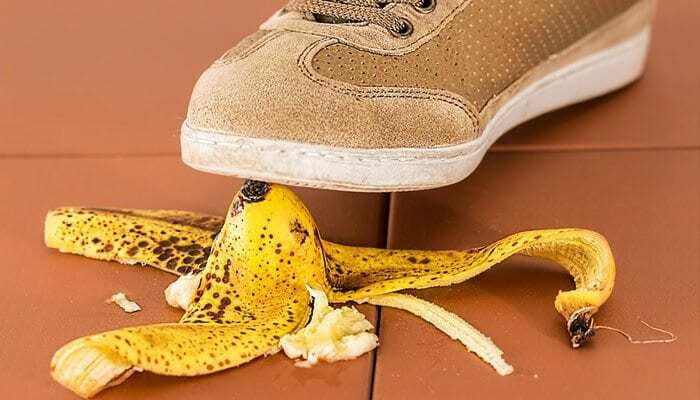 Before you purchase your non-slip shoe, especially if it is for work, it would be optimal to test the shoe to ensure that it does offer the traction it claims to, if you do not you might end up in a tricky situation when facing surfaces that are hazardous to walk on. A great pair of non-slip shoes will save you from not only from an embarrassing and potentially dangerous fall or slip at work, or when out with friends and family. They are an essential part of your work attire, especially if you work in a restaurant or factory environment. In fact, any person working for long hours on their feet all day would benefit from wearing the greatest & most comfortable non slipping footwear items they can get. In today’s world, you often encounter water, grease, oil and other substances on the roads, pavements and other areas you are walking in. It is best to have footwear that will prevent you from having a trip, slip or fall in any situation, even if you work in an office environment. Seniors, in particular, will benefit from these types of shoes to prevent those accidental falls that cause serious injury to them. It should be no surprise that we have chosen another one of Skechers footwear ranges as our top choice of non-slip shoes on our list. Skechers have been well-known for making the best slip-resistant work shoes for a long time and specialize in these types of shoes. The Men’s Rockland Systemic Shoes are lace-up shoes that have a nice casual design which is suitable for both office and work site. It features slip-resistant outsoles that have exceptionally good traction on them and can master even the trickiest of surfaces. Tested to Mark II standards, and conforming to EH standards for safety these are exceptional work shoes that will keep your feet safe and secure no matter what working environment you are in. Not only safe but stylish too, with a leather upper and a leather overlay with an inner sole is ultra-comfortable. These are high-quality work shoes for the discerning man and one of the best for people who spend a large portion of their day on their feet. Skechers does it again for our premium choice non-slip shoes. The Men’s Flex Advantage Sneaker are shoes that has the appearance of an athletic sneaker but the slip resistance of a work boot. Durable leather uppers combine with a mesh and synthetic fabric to offer both flexibility and breathability so your feet will not feel smothered during the long day. The insole is gel infused memory foam, this gives your foot a cushion to rest on as you stand or walk, ensuring that at the end of a long day working your feet will not have any ill effects. The insole is also removable. People with specific orthopedic needs can substitute their own personal insole into the shoes to help them get through the day at work with no pain or discomfort. The rubber outsole of the shoes have a fine tread pattern which means you get fantastic grip on any surface you need to traverse. 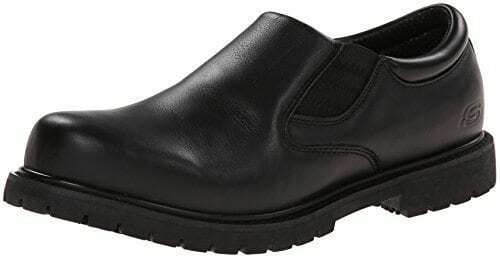 These are exceptionally good shoes for restaurant workers such as chefs or servers and work well for hospital and hospitality workers in general. Being a nurse or waitress is a difficult job and you don’t want to add sore feet to your list of worries when coming home from work. Women who work in these environments need footwear that will not only offer them comfort and be safe to walk in, they also want something with a touch of style too, as well as shoes that will not cost them a fortune to purchase. The AVIA Women’s Avi Union Service Shoes are just such shoes. It is incredibly well priced, looks great and serves its purpose very well. That makes it our great value choice for non-slip shoes on our list of the 12 best. The sole of the AVIA is designed to push away the liquid from the sole of your shoe, this is what a great non-slip option does as it enables your footwear to maintain their grip on the surface you are walking on preventing slips and skids and potentially dangerous falls. Elderly people tend to be at risk of more slips and falls – read the study here. The outsole is oil & slip resistant (read the study). Lightweight, breathable and most of all comfortable the Avi features an EVA soft gel heel which is shock absorbing and the sock-liner which is also molded EVA is removable. Padded tongue and collar and the AVIA’s Cantilever System make this one of the greatest, most comfortable non-slip footwear in this price range. We hope you enjoyed our article on "The 10 Best Non Slip Shoes", if so, please share and rate it.